I’ve mentioned in a few posts that I use a homemade lesson plan sheet for my kiddos (how to use binders for individualized lesson plans is one). We’ve done this for as long as I can remember. We used mom made lesson plan papers in addition to Sonlight’s IG, Tapestry of Grace’s, and now BiblioPlan’s. While each curriculum I have used has included some kind of lesson plan page, I didn’t use them alone for many reasons. I needed to use the pages again (for another child, another year). I had more subjects than the IG covered. I wanted more personalized lesson plans. So… I made my own. I have always used Word tables for this. It’s not difficult at all. Let me walk you through it. I also include a blank one at the end that you can use, if you don’t want to make your own, but it won’t be personalized. Create a title, centered at the top of the page. For example: Esther’s 3rd Grade Lesson Plans. Make the font fun, if you like, matching the child’s personality and size it nicely (24pt or more). Click enter two or three times (this depends upon how many subjects you want in your table, really… the elss subjects, the more spaces in between the title and the table) to create some space between the title and the table you are about to insert. Click insert table and drag over for 6 across (if you have a five day school week, 5 across if you have a four day week) and ____ down (insert number of subjects you want in the lesson plan here + 1). In the first box of the table, type Week: Date: in a 12pt font (easy to read). Across the top of the table (after the week/date box) type either the days of the week or numbered days (ex: Day 1, Day 2, Day 3, Day 4). These will all be in the very top row of your table/lesson plan boxes. I do this in an easy to read font, not the title font, which is more fun. Increase the font to 18pt or so and center the text (highlight it and click the center button). Next, down the first column, you will type the subjects for your student. These will be all in the very left hand column, down the page in the easy to read font and use a larger size (16pt or more). Click enter a few times to make the boxes as big as you want. Some of these boxes, you may not want very big (ex: if all you write in the lesson plan for math is #34, you don’t need much space) and some you’ll want bigger (ex: for writing, if you need to write out the entire assignment, you will need more space). You can be as specific as you want and/or as specific as your state requires you to be. I often put the curriculum for some subjects. For example, I don’t just type vocabulary, but I title the box Vocabulary: Wordly Wise. This is not for my state requirements, but for my children who may forget what I mean. Seriously. 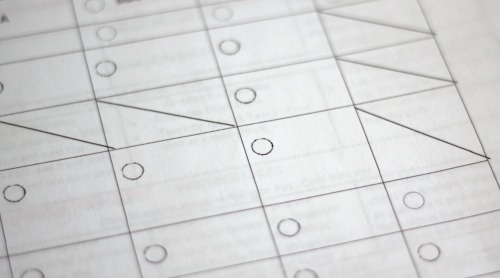 Personalize the lesson plans more by adding check boxes/circles or by crossing out days. We do not do Latin every day, so I cross out Day 4 for Latin by inserting a line in the box (click add shape, line, then click the top corner, drag the line to the other corner, and unclick at the bottom corner). I also prefer check circles for most days since we just do the next assignment in the curriculum and I don’t need to write out anything (click add shape, circle, go to where you want the circle, click; you can copy and paste this one circle over and over again in the boxes you want circles, so they are all the same size). The check boxes/circles are also helpful in that they provide something for the student to check. Sure, they could just cross out the assignment, but it’s more fun (and looks nice) to have a spot for the checkmark, marking the work as completed. Personalize further by adding any repeated text. We use Wordly Wise and the lessons repeat each week, so I simply put the letters for each day in the correct box. All I have to do when writing the week’s lesson plans is add the number of the lesson we are on that week. You may have other repeated aspects. It will save you time to just type them in now, instead of writing them each week. Tweak the sizes of the columns and rows. This is personal and for space as well as aesthetics. You don’t need your week and date box to be very big, so adjust it, if necessary. You hover over a line and then click and drag to adjust. Save into your documents folder. Repeat as necessary for the number of students you have, personalizing each appropriately. 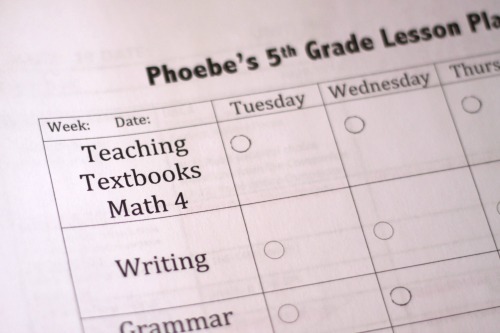 These lesson plans can change as your homeschool does, for each student. Every year, I open the lesson plan document from the previous year, edit as necessary, then save with the new title (student’s name and school year). You can even copy the lesson plans from your curriculum and print your personalizes ones on the back, saving paper. Don’t forget the highlighting tip, if you use the curriculum lesson plans and they include more than your child actually needs to do. I have friends that use computer programs for lesson plans, but I haven’t tried them. These work fine for us right now, especially since we don’t have a computer each child could utilize for lesson plans. Here is one of our lesson plan papers, in case seeing it helps you. Here are some of blank ones for you to personalize, if you don’t want to make your own.